From extravagant to minimalist, Lollapalooza beauty looks ran the gamut. Creativity is at its peak during festival season, and this year, festival-goers at Lollapalooza proved to be more eccentric than ever. Here, a recap of the top trends spotted at the Grant Park festivities. While glitter has been a festival beauty staple for years, the whimsical flecks at Lolla were applied more elaborately than ever. For an extreme take on strobing, women kissed their cheekbones, brow bones, and collarbones with glitter versus a traditional highlighter. Some even amped up bold hair colors, coating their strands in glitter to create a majestic effect. For any festival, it's important to opt for hairstyles that are equally beautiful, and practical. (There's no place for a sleek blowout in a mosh-pit.) Hence the reason various iterations of braids often make an appearance at music festivals around the world. French braids, Dutch braids, pigtail braids—you name it! The styles not only looked amazing, but they were great for keeping hair out of guests' faces as they danced to The Killers and Chance the Rapper. Those who sprinkled a touch of glitter to their braids won our approval. Struggle to re-create Pinterest-inspired looks you dream about? The Lollapalooza Art Market offered two different booths to amp up festival-goer’s beauty looks. “Festy Besty” sold pots of glitter in multiple colors, and even applied it for buyers free of charge with their purchase. Glam-O-Rama is also a traveling salon that offers face and body glitter, hair braiding, and more at festivals around the country. Cliché as it sounds, sometimes less is more. Lolla pros have learned from experience that a simple makeup look—or no makeup at all— is best for the outdoor festival. This year's tumultuous weather was hot and sunny one moment, then resembling a monsoon the next. Light foundation, a stroke of waterproof mascara, and a swipe of bright lipstick withstood Chicago’s unexpected weather this year. Most importantly, festival-goers who wore their looks with confidence were most impressive. Check out the slideshow below to see a few of our favorites. Best friends Lulu and Lauren got their glitter looks done at the Festy Besty tent in the Art Market. Sarah created this graphic eye look herself. 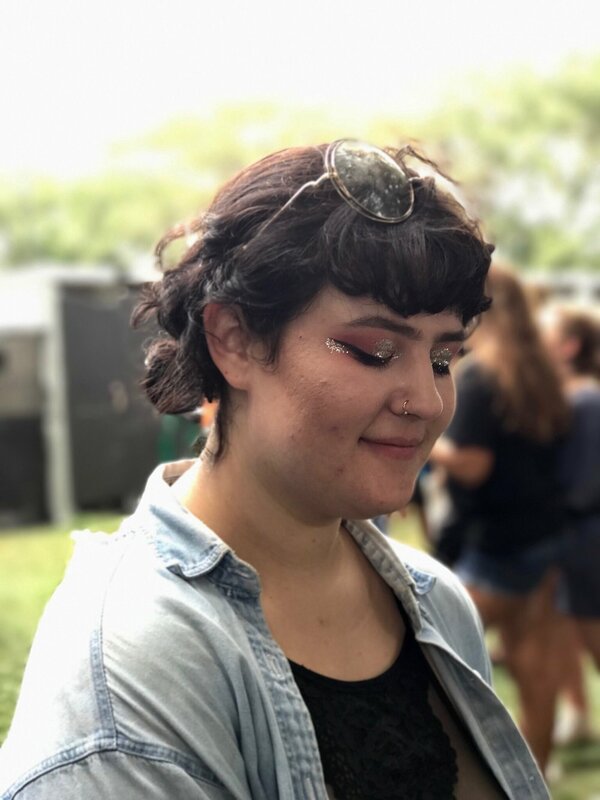 "I just started really getting into makeup, so I wanted to bring it to Lolla. The inspiration came from a YM shirt!" Leah opted for a simple, dewy look, which made her skin look fresh and glow in the sun. Sonni demonstrated how to add a simple touch of sparkle to any makeup look. "I love glitter and allowing myself to be seen different from everyday life." Samantha combined braids and glitter to create this whimsical hairstyle. Brennan used real flowers from Grant Park to transform her hairstyle. "I've never expressed myself much, but this is the one day that I can [try a trend] I've never tried."